There are two major problems that the report identifies. The first is that the definition of hostile intent, which permits soldiers to use force in self-defence, is overly vague and allows for misinterpretation. The SROE defines hostile intent as the ‘the threat of or imminent use of force against the United States, US forces or other designated persons or property’ but does not provide any guidance on how to interpret this definition or make use of it in practice. The military’s own reports point to numerous examples where civilians have been shot and killed at checkpoints because their erratic driving was considered to be threatening. In many of these cases, the driver had simply misunderstood the instruction issued by soldiers. This problem is compounded by the ‘dangerously broad’ definition of imminence in the SROE, which specifies that these threats do not have to be ‘immediate or instantaneous’. Other coalition partners have adopted a far more restrictive definition, with NATO defining an imminent threat as one that is ‘manifest, instant and overwhelming’ (see also). NATO is also much more specific about what kinds of behaviour should be considered threatening, providing soldiers with examples of actions that could be interpreted as hostile. But the basic problem according to the IHRC is that the rules and regulations are overly ambiguous and unnecessarily subjective, making it difficult for troops to make the split-second decisions expected of them. The second problem identified in the report is that soldiers were not given the tools needed to distinguish between combatants and non-combatants in practice, although the authors suggest that there have been some signs of improvement. During the early stages of both conflicts, the laws of armed conflict were covered only in passing, which meant that soldiers had little practical experience differentiating between friend and foe. There have, for example, been a number of cases where soldiers have shot and killed farmers digging late at night because they had assumed the farmers were insurgents planting a bomb. As a result, the military has sought to integrate vignettes, simulations and even computer games into the classroom to help soldiers make more nuanced decisions. Likewise, the report argues that there needs to be a greater engagement with the local population to ensure that soldiers understand local customs and local behaviours (see also). 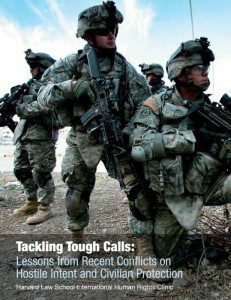 Soldiers who make the effort to interact with locals will, the report argues, be ‘better equipped to differentiate between behaviour that is threatening and behaviour that is routine for a specific area’. Despite these obvious improvements, the report warns that these developments have not been codified into military doctrine or fully institutionalised into military practice. As the military moves on from one set of conflicts and finds itself immersed in another, there is a danger that the lessons learned in Afghanistan and Iraq will simply be forgotten. The report raises some important questions about the deadly effects of soldiers forced to make split-second decisions based on a pretty ambiguous and imprecise set of definitions in extremely difficult and testing circumstances. But I do have a few lingering concerns about the recommendations that the report makes, as it seems to be proposing a technical fix to what is a decidedly political problem. After all the suggestion that mistakes can be avoided by finding a more precise definition of hostile intent and adopting a more restrictive understanding of imminence can only take us so far, given the uncertainty that these decisions necessarily entail. Better definitions may reduce the margin of error but it would be wrong to assume that we can make war more humane by simply tightening our grasp on language. What is missing is any reflection on how these definitions work to constitute certain populations as killable, how they help to legitimise the violence inflicted in war and how they often work to conceal the deaths of civilians on the battlefield. The other concern I have with the report is its emphasis on understanding the cultural terrain, which overlaps considerably with the military’s controversial human terrain system. The suggestion that soldiers should learn as much as they can about local customs so that it is easier to spot threatening behaviour is clearly very sensible. As I have already noted, there have been far too many incidents where civilians have been killed because soldiers misread perfectly innocent behaviour as dangerous, whether it was driving too fast at a checkpoint or tending to crops late at night. But there is also a danger that ‘abnormal’ or ‘unexpected’ behaviour will automatically be read as threatening, further undermining attempts to generate a more precise and less subjective understanding of what counts as hostile intent. The military is already well-aware of the advantages to this ‘pattern of life’ analysis, which it views as a more prosaic counterpart to the surveillance techniques we have until now associated with drone warfare. The ability to identify insurgents hiding amongst the civilian population based on their behaviour is clearly a useful tool for the military but we should be very worried about what this means for the already fragile distinction between combatants and non-combatants, soldiers and civilians. I’m willing to be the venerable “scholars” of Harvard Law School, in their ivory tower, will never see the consequences of their research first hand. Meanwhile American soldiers are being killed on the battlefield because they are afraid of being sent to jail by their own country for ‘defending themselves’ too vigirously, and dying because their leadership fears collateral damage to foreign nationals more that losing the lives of their own troops [Reference the circumstances of MAJ William Swenson’s CMOH citation]. When did the lives of our country’s own soldiers become worth less than the lives of Afghan civilians? The ROE that have dominated America’s last two wars are a sick farce implemented by politicians and academia who will never have to serve on the front lines of combat. Death and destruction are an inherent consequence of a nation choosing to go to war and if a country’s people can not accept it, it should avoid war in the first place. I’m willing to bet Mr. Gregory or his family has never served in the military or seen actual combat. Yet he has the nerve to write about a subject he has no knowledge of, or stake in. I’d like to see how your high minded ideals survive your first troops in contact… Leave war to the soldiers sir.